To get your free bonuses and join the list of readers following this author, CLICK HERE. Burnout to Bliss is about an awakening experience that occurred over two years, 1989-1991. 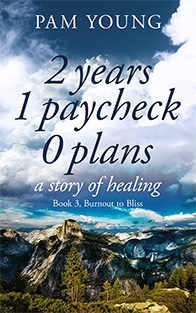 Dr. Young’s transforming journey from Burnout to Bliss is told in a series of stories, each emphasizing a particular concept — from the madness of extreme BURNOUT to regaining lost confidence and self-esteem (CYCLING in the CITY) to surrendering in faith for the remaining 18 months when she had to leave her sanctuary. These experiences not only changed her life but undoubtedly saved it. The series concludes with BLISS, a manual of lessons learned about forgiveness and a metaphysical perspective about the two-year journey and the roles of players. Book 4, BLISS, shares lessons learned and techniques for living a simple and joyous life — like forgiveness. It is the bookend to this series and offers metaphysical insights into her journey — a perspective accessible only by waiting nearly thirty years to write the series.